Yashwantgad was built in Nate village on the banks of Arjuna river which is also a creek in the district of Ratnagiri. Goods used to be transported from the port of Musakaji which is near the fort to Rajapur port through Arjuna creek. To keep a vigil on this trade route two forts were built � Ambolgad in the sea and Yashwantgad on the creek. The British had also built a warehouse which also served as a small fort in Rajapur port area. With one�s own private vehicle one can visit Rajapur warehouse, Dhootpapeshwar temple, Satavli fort, Yashwantgad fort of Nate, Ambolgad fort and Purnagad fort in one day and return to Ratnagiri. The fortification wall and the bastion with a flag on it can be seen alongside the road while going towards Ambolgad from Nate village. There is a 4 feet wide and 6 feet deep trench built before the fort approach. These trenches were built to avoid direct attacks on the fort wall. To enter the fort one has to go till the edge of the plateau on the left. We have to enter into the trench first before entering the fort. But before entering the fort proceed to the bastion with a flag on it. At first we come across a temple of a local diety Siddhapurush. Further from here we can see a carving of Lord Hanuman on the wall of the trench and a small porch to light a lamp. There is also a semi-circle shaped well ahead. To draw water from the well there are two pillars and a pulley installed on the bastion so that one need not enter the trench for it. After this head back to the entrance of the fort where we come across a door hidden between two bastions. The arch of this door is devastated. There are two porches built on the either side of the door to shelter the door keepers. A huge bastion has been built in the middle of the fort with steps to access it. Similar type of bastions can be seen in land forts and also the sea fort of Sindhudurg. This type of bastion was used for keeping an eye over the entire fort premises and also on the outer areas. Yashwantgad fort is divided in two parts. One part is on the plateau and the other spreads till the creek area. As the area till the creek is covered with dense vegetation and Mango orchards, it remains inaccessible. There are two store rooms and a well near the bastion with flag on it. Keeping the bastion to the right proceed ahead to descend on the lower part where there is a door way. Lord Ganesh and Lotus flowers are carved on the door. From here move towards the wall to the right which is spread on the plateau. There is a trench on its outer side. Where this wall ends there is a bastion. The wall continues further from the bastion to the creek. Due to the dense forest cover there is no direct access alongside the fort wall. Thus we have to get down to the steps built which leads to the creek area. There is a well here and a path besides it takes us to the fortified wall built on the creek side. Studying the surroundings from this area we can clearly make out the strategic location of the fort. There is a house built on the bastion which is built on the edge. Although no one lives here this house and the fort premises belong to the Patki family. There is also a well in front the house. 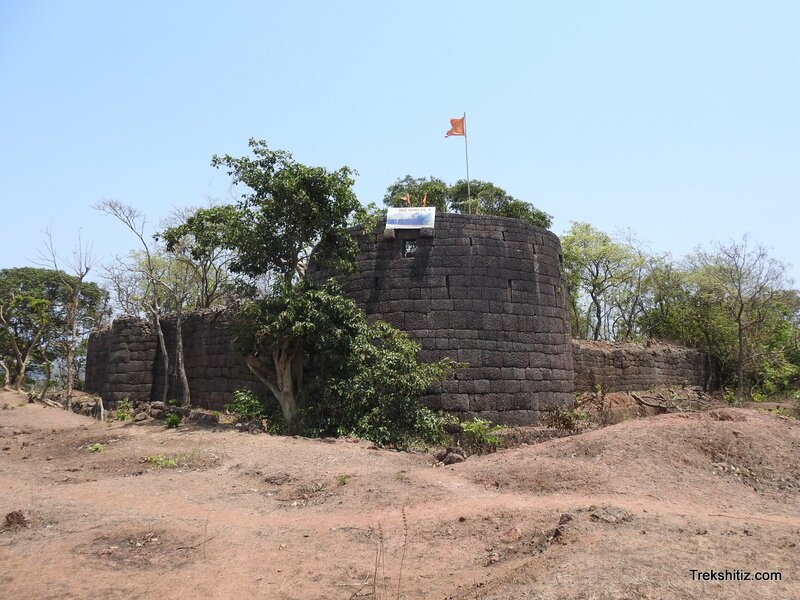 The fort can be accessed by two routes � Ratnagiri � Pawas � Adivare � Nate or Rajapur � Nate. S.T. buses are available from Rajapur and Ratnagiri to reach Nate. It takes 15 minutes on foot to reach the fort from the village or one can also opt for an auto till the base. Buses going to Ambolgad can be taken to alight at the fort. Available in Ambolgad village in Rushi Paryatan.